The Niagara is made up of two waterfalls in West New York, USA on one side and South Ontario in Canada on the other, lying between Lake Erie and Lake Ontario, on the international border. American Falls are 55.5metres/182 feet high and 328m/1076 ft wide. Canadian Falls, known as Horseshoe Falls are 54m/177 ft high, 640 m/2100 ft wide. It has been a popular tourist attraction since the early 19th century. Angel (upper fall) in Venezuela is considered the highest waterfall in the world. Its height is recorded as 975m/3212 ft. Among the ten highest waterfalls in the world, five are in Norway, two in South Africa, and one each in Zimbabwe and USA. Sri Lanka, in comparison to its size, has perhaps the largest number of waterfalls of any country in the world. Indeed, there are nearly 400 in Sri Lanka. A recent study undertaken by the Lanka Council on Waterfalls (LCWF) - an organization set up to improve public awareness and understanding of water issues to promote the conservation and wise use of nature and natural resources - has recorded 382 waterfalls in Sri Lanka. Bambarakanda Falls is the highest waterfall in our country. It is 241 metres and it ranks 48th among the 100 highest waterfalls in the world. It is formed by the Uduweriya Haputale mountains’ Kuda Oya, a tributary of the Walawe River. Situated in the Badulla district, where there are 33 waterfalls, Bambarakanda falls within the Haldummulla Provincial Council area. It is on the Colombo-Badulla highway and is 18 km away from Belihuloya, where the popular rest house is. It is 27 km from Koslanda and is also quite close to the World’s End, one of Sri Lanka’s major natural tourist attractions. The approach to Bambarakanda is not difficult. Diyaluma, the third highest waterfall in Sri Lanka, is one of the most popular mainly because of its easy accessibility. The 114 metres high waterfall is in the Ratnapura district which boasts of 109 waterfalls - the most in the country. Situated on the Koslanda-Wellawaya road, it is just six kilometers away from Koslanda and 13 km from Wellawaya. Among the legends related to Diyaluma is one about a king who had fallen in love with a young woman belonging to a lower caste. The king’s subjects were angry about it and the couple decided to flee. Arriving at the site of the fall, they began climbing. The king made it to the top but the creeper the woman was hanging onto became entangled in rocks and she plunged to her death. It is said that the tears shed by the king in his grief were collected by a deity and turned into the fall as it stands today. Ramboda Falls on the Nuwara Eliya - Pusselawa road is 109m tall. It is a double fall borne of the many convergent brooks in the area that flow into the Puna Oya Reservoir, a tributary of the Kotmala River. Take the Nuwara Eliya - Pussellawa road for 12km.The fall is located 1.5km from the highway. It is 10km from Pusselawa Resthouse. Demali Falls, also in the Ratnapura district is 105m in height and flows to the Deni River. There is a massive crevasse at the base of the fall. Many are the theories as to how the fall got its name. One is that it has got its name from 'de-mala', meaning 'twin falls'. Other tales of folklore are all connected with Tamils. One is that a young Tamil (demali) shepherd woman who was carrying a pale of milk from Ambagaha Arawa village to Kiri Kandula village was startled by a nefarious king. The woman panicked and fled but tripped, fell into the fall and got drowned. Take the Avisawella - Hatton - Nuwara Eliya road via Talduwa to Deraniyagala to reach the fall which is situated 85km from Colombo. It is 50km away from the Kithulgala resthouse, the popular stop famous the world over as the location where the award winning film, ‘The Bridge on the River Kwai’ was filmed. The Galdola Fall (Ratnapura district) originates from a tributary of the Rakwana river, which flows down the eastern slope of Suriyakande mountain in the Sinharaja forest reserve. The water courses over rock-strewn terrain and at times the flow is submerged by rocky outcrops. This profusion of rocks gives the fall its name ‘dola’ meaning ‘rockpool’. The fall is situated at the 82nd mile post near Rakwana, on the Ratnapura - Pelmadulla road. Rakwana rest-house is just 3km away. The 100m-high Elihatha Falls, as the name suggests, encapsulates a series of seven falls, each identified by a number. The first can be viewed from the Udaboda Estate (Kegalle District). To view the second fall, walk past Maliboda Bazaar, through Uda Malimboda, Nuriya, Thalawa and on to Dickwella mountain. The other five falls are difficult to reach. The fall is situated in the Nuwara Eliya district at Bambargala mountain in the Middeniya ‘grama niladhari’ area. The only road on which to approach the fall in any type of vehicle, is from Deraniyagala to Malimbada. Go up to Uda Malimbadatown, and then use the road running adjacent to the cooperative of Uda Malimbada. The nearest town is Deraniyagala. Aberdeen fall is located 6km from the Nuwara Eliya District in the Kehelgamuwa mountain range, which encompasses an area made up of Ginigathhena, Norton Bridge, Lakshapana and Maskeliya. There are a number of routes to the fall. The first involves using the Maskeliya - Dehigasthena road, and then trekking for a distance of about 2km. Another route is from Norton Bridge to Kalawelldeniya and trek from the 3rd mile post for a distance of about 1km, but one has to watch out for wild terrain and abundant leeches. Thirdly, start from Ginigathhena town and head for Ella Uda. When you reach the Alagala village in Hulanwanguwa, Aberdeen Falls is visible from a distance. Devon Falls, also in the Nuwara Eliya District, has been in the news in recent months since it is one of the six falls affected by the proposed upper Kotmale hydro-power project. Environmentalists argue that this project would have an adverse impact on the environment. A front view of the 97m-high fall is possible from Midigama. Devagairi Falls in the Kegalle District is 90m in height. Yet it is not popular with visitors as the route involves a trek through tea estates and difficult terrain. It is also not possible to get a close view. The source of the fall is the Dedugala Ehala Palanpitiya mountain in the Kegalle District. Lanka Council on Waterfalls (LCWF) released Sri Lanka's first CD titled "Sri Lankan Waterfalls". This is the first ever CD in Sri Lanka which contains 383 waterfalls with photographs. The launching ceremony held at National Library Auditorium, Colombo 07 Saturday 22 and Professor of Environment Science at University of Colombo, Sarath Kotagama. President of LCWF Chief Engineer of Welioya Irrigation Project, Anura Nelugolla and several other speakers delivered lectures at the launching ceremony, states a press release by LCWF. The event was initiated by Lanka Council on Waterfalls after research from January 2001 to December 2004. LCWF completed their first national study on Sri Lanka Waterfalls. At the end of this study 382 waterfalls in Sri Lanka were identified. Earlier only 99 waterfalls had been recorded. This program had the objective of developing a set of activities that would contribute towards the study of waterfalls by LCWF. LCWF is a non-profit organisation which has worked nationally and internationally since its inception in 2000 to improve public awareness and understanding of water issues with a view to promote the conservation and wise use of nature and natural resources. LCWF designs and manages innovative high quality programs that build capacity in the field of environment education. 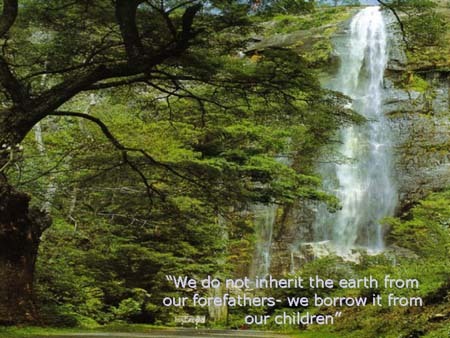 LCWF's program and activities seek to create awareness and enable individuals and communities to make decisions that favour environmentally sustainable development. The CD contains details of 383 waterfalls with photographs, lists of the highest waterfalls of the world, popular waterfalls, world waterfalls, websites, several other environmental important facts with environmental information centres, most influential green groups and individuals, Sri Lanka Green Award Winners, Sri Lanka's Environmental Issues and Problems, Web Directory of Sri Lankan Green NGOs and World Environment Day themes. The CD can be obtained by calling 011-281 78 03 or e-mailing lcwf@sri.lanka.net or it is available in LCWF, 7A, Albert Perera Mawatha, Nugegoda. From the Nanu Oya, the water flows through the Udaradella and Bambarakelle areas to the Nanu Oya Falls. The water cascades through mist down a sequence of 25 steps (60m in height) before joining the Kotmale and Mahaweli rivers. A hint of grandeur is added to the scene by the imposing bridge that spans the fall. To reach the fall, take the highway from Kitulgala, over a bridge, to Malwatte. From here, climb the mountain above the Girankitha Oya Reservoir (across the road at a small hamlet in the rubber plantations) for 3km until a footpath is reached. After about 400m, the footpath reaches the fall. Alternatively, take the highway from Kegalle, and 13km before the town of Bulathkohupitiya, Mannaketi Falls can be viewed on the right-hand side. The Kitulgala rest-house is 5km away. The 53m-high Diyavini Falls forms part of a tributary of the Diyavini River, which is in a jungle 8km east of Balangoda, south of Vikiliya. The tributary, together with another stream created by the Diyavini River, flows into the Walawe Ganga. The Devagiri Vihare and an ancient Dagoba overgrown by the jungle are nearby. Take the Balangoda - Weligapola road to Kapugala road and the ancient village of Diyavini. The fall is located near the old Rajamaha Vihare Delta Fall has six streams and is 50m in height, flowing through shrubs down a rock-strewn slope. Its source is a tributary of the Kotmale river. This is also the site of Sri Lanka's first tea plantation. Introduced by the Dutch and owned by Rothschild Vomes, it proved unsuccessful. To reach the fall, from Ratnapura town, head towards Balangoda via Wevelwatte and the fall can be found in the village of Balakotunna. Alternatively, from the Wevelwatte junction, head towards Balangoda for 1.5km and turn right at the tea estate. From here, it is necessary to trek for around 100m along the track adjacent to the estate to reach the fall. This 53m-high fall cascades in two sections. At either side of the upper segment there are two elephant trunk-shaped stone arches. The fall's source is the Devipahala Ela Canal, which flows through Demalegama village before pouring off a rock ledge. The surrounding wooded area contains herbal plants such as ruliya, hathmetiya, vitex attissima and helapeda. Diverse species of wildlife can also be found here, including wild boar and deer. Dodan falls can be reached by taking the Colombo - Ratnapura road and turning right at Higashena bazaar, down Devipahala road. Continue for 5km to find the fall, which is situated along the route that also leads to Bopath Falls. Among the most popular waterfalls in Sri Lanka is Bopath Ella mainly because of its close proximity to Colombo. Take the road from Colombo to Ratnapura and before you reach Kuruwita, turn left along Devipahala road. The fall is just three kilometres down the road. The distance is around 90km from Colombo. Many are the folk legends connected with Bopath Ella. One is about a young man from Colombo, who visited the falls and on losing his way was helped and sheltered by a local village girl. A romance developed between the two and she became pregnant before his departure. He left promising to return but never did. Overcome with grief, she took her own life by plunging into the fall. Villagers say that her ghost haunts the fall. She is supposed to appear as a floating blue light. Another local belief is that a treasure trove lies somewhere within the fall and that one thousand human sacrifices are needed to retrieve it. The fall is rich in bio-diversity. The surrounding plant and tree life includes attikka, kumbuk, midella, dun, para, ginihota, rathmadiya, ketala, and many more. There are many varieties of orchids too. Animal species include wild boar, meemina deer and reptiles. The water is home to many species of fish including bulathhapaya, lellu, magura, korali, sonnu and eel. Situated in the Ratnapura District, Bopath Ella is in the Kuruwita Divisional Secretariat at Agalwatte village. Peessa Falls, a 45m-high fall is enchanting and one of many in the Uva region created by the rains. It is not widely known and is created from an aquifer at the peak of Lunugala Mountain. Later the water flows into the Kurakkan Oya, which flows across Madolsima. The fall is the only one in the area that flows all year round, regardless of droughts, even surpassing the better-known Dunhinda and Diyaluma Falls. When it rains, the extra volume of water makes Peessa Falls cascade in two streams. The cave is 135m in length and has two parallel doors. In addition to the main cave, 12 others can be found here. To the right above the door is the bat colony and the cave in which they give birth is known as the 'Malwathu (Garden) Room. It can be dangerous however, as reptiles slither their way inside, attracted by the presence of the bats' young. The limestone formation covers an area of 52 square kilometres. Within the cave is a limestone pit, which is still growing. There are fossilised remains of an animal here. Adjacent to this is a layer of sea coral. So many and varied are the attractions of the cave. Pandioya Falls, another waterfall in the Ratnapura district, is 45m in height and enclosed by woodland. Its name derives from the 'pandi' (Garra ceylonensis) species of fish that are a formidable sight swimming upstream along the rocks, against the flow of water. The fall's source is the Pandi river, which springs from the nearby Bathgurula mountain (1045m), south-west of the Sri Pada reserve. It later flows to the Kaluganga. Bambarakanda provides a stunning backdrop. Above the fall lies 32 hectares of land with an artificial lake and patch of jungle, which belong to Hunnas Hotel. The woodland consists of cyprus, pyness (pines), teak, pihimbiya, huna and ratadel. Numerous types of orchids also grow here. The surrounding area is home to a wide variety of wildlife, including deer, porcupine, monkey, mongoose, wild boar, pangolin and the forest eagle owl, while the water is alive with fish. The area is subject to every climatic condition of the island. During the colonial era, a British national owned tea plantations near the fall. He had a flower garden, artificial pool and golf course put up for his wife. Local villagers believe that during times of prolonged drought, the Gambara deviyo is seen carrying a torch through the mountains at midnight. The local villagers believe that the daughter of ancient warrior King Sitawaka Rajasinhe bathed here. On one such occasion, the princess' ring slipped from her finger and into the pool. For a moment it floated to the top, but then a huge rock fell on it from above, pinning it to the riverbed. Here it is said to remain. King Sitawaka Rajasinhe's treasure chest is also rumoured to be hidden here, but many attempts by villagers to retrieve it have failed due to the demon that guards it, they say. Such is the power of legend, that in April 2002 an armed posse of treasure hunters carrying digging equipment, worryingly accompanied by a senior superintendent of police, was apprehended by villagers before it engaged in too much skullduggery. Jodu Falls, also known as 'Bambarelle Knuckles', are twin falls with identical lengths (45m). They cascade simultaneously from both ends of the mountain into the Mahaweli ganga via the Huluganga. The Moragaha ganga is the source, which springs from Me Malai, part of the Knuckles mountain range. Before reaching the falls, the water flows down seven chutes and through several pools. Apart from the famous Dunhinda Falls, there is another fall, also in the Badulla District, with the same name. It is identified as Arawakumbura Dunhinda Falls. The 45m fall is full even during the dry season. The source of the fall is the Ibban Oya, a tributary of Gal Oya. A number of valuable trees are found in the area, locally known as suriya, mara, bulu and Nellie. Duvili Falls is said to be receptive to Kataragama God's blessings. People believe that children after they have reached the age of two, who are washed for the first time in the fall's water on a Thursday, will be endowed with good health. They will avoid those infections commonly known as 'deiyange leda' (God's sicknesses), such as measles and chicken pox. Take the Balangoda - Kalthota road to Kalthota. The fall is to the west of the Kalthota Tenna bridge, up the Walawe Ganga Andawela Falls flows from the Nayameruhinna mountain range and is 40m high. It is situated in the Andawela village in the Nuwara Eliya district between Walapane and Hanguranketha. It can be found at the 31st mile post on the Kandy-Ragala road. A convenient place to stay is the Hanguranketha rest-house, which is 50km from Kandy. Kaluwala Falls has got its name from a pool filled with dark water (kalu wala) at the top of the 38m-high fall. According to folklore, King Mayadunne is said to have bathed here. The Ulugala village in the Imbulpe Divisional Secretariat area (Ratnapura District) is home to the fall. Take the road from Balangoda towards Pinnawala, past Pidaligannawala village via the suspension bridge over the Ranmudu River. Take the Kotiyakanda road at Ulugala. Lovers' Leap Falls is a beautiful 30m fall which commences from the streams and brooks of Sri Lanka's highest mountain, the Piduruthalagala (2524m). It flows over hard granite ledges and the water is collected in a tank and used for drinking. In dry spells, the flow is weak. Galboda Falls is 30m high but the width ranges from between 3m and 6m, depending on the season. At certain times of year, the water also cascades in two streams. Growing in the surrounding woodland is a rare species of orchid and the vicinity is home to a wide variety of wildlife. Among them are 12 species of reptile and four are only found in Sri Lanka. The upper section of the fall is unique in its biodiversity, thus it is of paramount importance to limit any potential danger to the area. 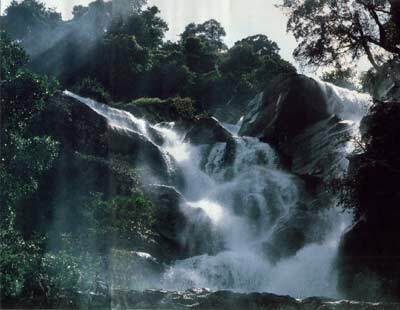 The Gal Oruwa Falls' catchments are the aquifers of Sinharaja Forest. The stream flows between two boulders measuring 30m high 2m wide & 40m in lengths. There is a boulder at the bottom covering the fall on three sides, resembling a boat synonymous with its name-' Rock Boat'. Located in Lankagama Village, Galle Districts, Hiniduma Electorate, the fall can be reached along the Lankagama road nearby a hydropower project. Diya Egirena Falls is a 30m fall which was previously known as 'Diyawegirena Falls', denoting its perennial flow, but underwent dialectal change to its present form. The plants in the surrounding Dedugala Reserve have valuable medicinal qualities but are being pilfered by unscrupulous thieves who sell them as ornamental plants. The fall is located at Pallampitiya village in the Bulathkohupitiya Divisional Secretariat, Kegalle District. It is 96 km from Colombo, 24 km from Navalapitiya and 3 km from Dolosbage. According to folklore, the fall derives its name from a desperate suicide attempt, where a mounted monarch leapt from its upper reaches. Villagers say that the fall sometimes emits a fearsome roar that can last for 15 minutes, and that this signifies that it will claim a human sacrifice within a two-month period. 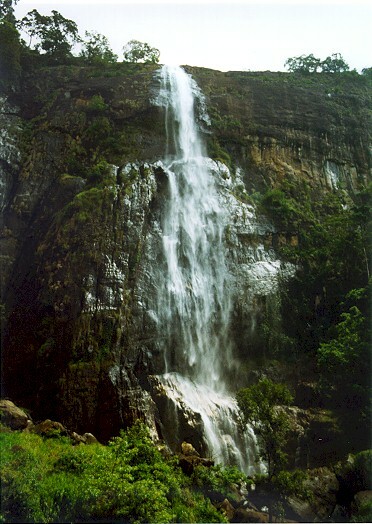 Maduwanwela Doovili, a 25m fall is a creation of a branch of Adaluwa ganga, called the Arapora ganga, beginning from Sinharaja. The fall is located in its precincts at Ratnapura District in the Kolonna Electorate. There is a two-stream fall located above. But the main is the Maduwanwela Falls. The two other minor falls located below measures 10m & 12m respectively. The minor fall called Aralu Falls is situated below the Dooli Falls. According to a villager, the name epitomizes the water flower created by a rock situated at its midst. It cascades in a misty spray. A conduit above the fall supplies water to Chandrika Wewa via Panamura Irrigation Network. To get to the fall travel from Embilipitiya along Kolonna road, which is in front of the Maduwanwela Walauwa. Another route is the Kolonna Road, running from Ratanapura across Madampe over Rakwana-Suriyakanda towards Maduwanwela where the fall is situated.